The Septuagint is a Greek version of the Hebrew Old Testament text, translated between 250-160 B.C. Modern scholars believe that this is a superior text and used by Jesus and the Apostles, but these are all assumptions. What do the facts truly say? Did Jesus use and quote from the Septuagint? 1. 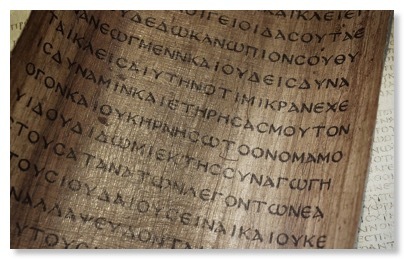 There is no reason that Jesus would have preached from a Greek version of the Old Testament. The Jews at the time of Christ used Aramaic, which is similar to the Hebrew of the Old Testament. There were very few Jews who used Greek as their primary language. In addition to these facts, there are no quotes in the Bible that come from the Septuagint text. 2. Augustine believed the Greek Septuagint to be "inspired" by God, as opposed to the Hebrew text. Jerome rejected this notion because he knew the Septuagint was developed by Origin who had used several corrupt Greek manuscripts to produce it. "Origin worked on "restoring" the Septuagint between 220-250 A.D. He claimed that there were as many different Greek translations as there were manuscripts. As he worked on his restoration, he had translations of Aquila, Theodotian and Symmachus in front of him. He also claimed to have two other Greek manuscripts that he found in a jar and at least two "corrupted" copies of the true Septuagint." 3. "In 1588 (23 years before the release of the King James Bible) William Whitaker wrote: "Learned men question, whether the Greek version of the scriptures now extant be or be not the version of seventy elders. The sounder opinion seems to be that those who determine that the Septuagint is wholly lost, and that the Greek text as we have it, is a mixed and miserably corrupted document." The AV 1611, on the other hand, is based on the Masoretic Text of Hebrew and Aramaic. The oldest Masoretic text is from around 900 AD. These Masoretic Jews continued the work of their predecessors, the Talmudists, of meticulously copying Old Testament texts. They treated the scriptures with great reverence. "All the extant manuscripts of the Hebrew Old Testament contain substantially the Massoretic text." Sir Fredrick Kenyon also wrote that "the Massoretes undertook a number of calculations which do not enter into the normal sphere of textual criticism. They numbered the verses words and letters of every book. They calculated the middle word and middle letter of each…These trivialities, as we may rightly consider them, had yet the effect of securing minute attention to the precise transmission of the text;"
Consider this quote about the underlying AV 1611 Old Testament text, with regard to the Dead Sea Scrolls, "the impact of this discovery is in the exactness of the Isaiah scroll (125 B.C.) with the Masoretic text of Isaiah (916 A.D.) 1000 years later. This demonstrates the unusual accuracy of the copyists of the Scripture over a thousand year period." We can see that the scriptures were being corrupted and changed, even back in Paul's day. So we need to beware of ancient corrupt texts. Discover how you can receive Christ's forgiveness today! At An Carraig Baptist Church, we take a literal, fundamental approach to the Bible (AV 1611). We are also a local, independent body of believers, which means we are not subject to any religious hierarchy. Being "Baptist" means, we hold to the Bible-based, Baptist Distinctives, that has been the hallmark of true Baptist churches through the centuries. You are welcome to join us at any of our weekly meetings, or schedule to meet for tea/coffee.